Local authorities face many challenges when it comes to creating successful places. 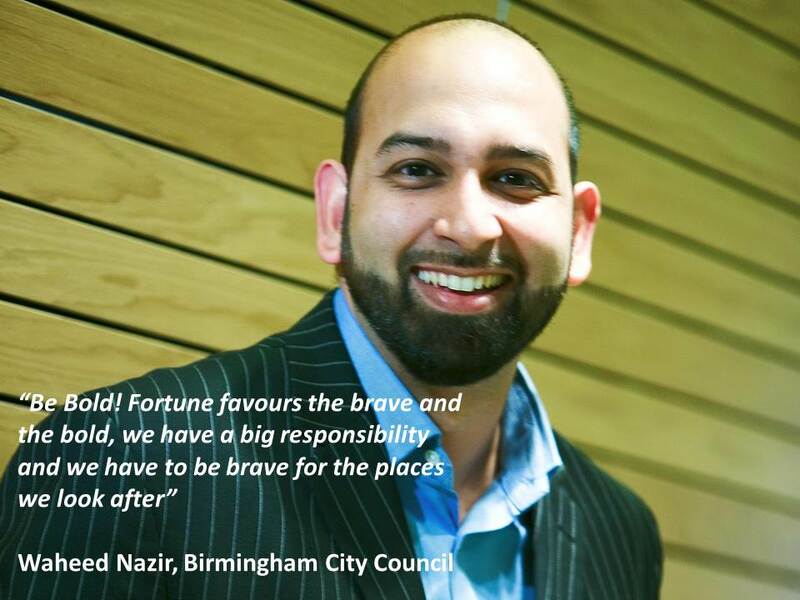 In this Q&A I speak to Waheed Nazir, Director of Planning and Regeneration at Birmingham City Council. I find out how his infectious enthusiasm for shaping and leading a skilled planning team has impacted on research and evidence. Waheed, can you describe the situation and challenges you faced leading regeneration activity in Birmingham? There was incredible talent but a lot of silo working. Even though we had a whole planning department, the functions were all separate, including housing and economic development – all well intended and trying to achieve things for Birmingham, but there wasn’t a bigger picture of what we were trying to create. 3. Develop my staff and utilise their skills at all levels. I needed strategic planners who understand and appreciate the local level market, and I wanted all professions, like planning control, involved in doing the policy. Applying real life knowledge and experience, and using the strength of the different disciplines to develop real talent. By doing this, although we had a 40% budget reduction, overall performance has gone the other way, because individual performance has improved so much. Staff who have left since, have gone on to do really well elsewhere as lead planners, and that’s my real achievement, that the plan put in place created successful staff. Although resources were reducing, our capacity increased, because from a regeneration perspective, in recession you aren’t firefighting with developers. As development activity slows, it’s important to use that time efficiently, to put in place the strategic documents and the structure you need for when activity returns. It’s a time to reskill staff and to invest in them, so all documents were written in-house. I developed a new ethos and culture, and gave them the documents to own and develop – this is the biggest learning experience. In 2011/12 I concentrated on organisational structure, roles and new direction – which focused on delivery. I wanted us to create a model of how we will deliver the big city plan which everyone bought into and understood. We worked extensively with government departments to take forward funding tools like EZ [enterprise zones], which now in place gives us funding to support infrastructure up to £1billion and we have already committed £275m. Population growth was the other big challenge facing the region; forecasts have changed and keep being revised up, the latest increasing by 150,000. As a result we need to do as much housing development as we can. I was not the biggest fan of the RSS (Regional Spatial Strategy) but it did provide a means of allocating land for housing, which was lost on a more strategic basis. What were the key tasks essential to creating your success? Vision is absolutely critical to what we are trying to achieve. Being able to articulate what you are trying to achieve is vital to getting everyone on board. Leadership – you have to be willing to make very difficult decisions, which can be unpopular. Strong leadership is key to delivery. People leave because of bad processes and lack of leadership, so I encourage leadership across the team – if the policy or process is wrong then change it and replace it, and people administering it are often the ones best placed to see this. The right structure to deliver the vision. Making sure you have the right range of skills and different types of planner, with different perspectives and approaches, and with the right approach to challenging. Pick people who are better than you to complement your strengths. I developed our own graduate programme to grow our own high quality staff with these qualities. Focus on who the customer is, and what the process they have to deal with is actually doing. For instance, ‘if I am selling my house and can’t find my application’ – we scraped the charging fee as it’s easy to do, not labour intensive and really helps the customer out for very little effort. The places we change and the people we service are the important thing. Never thinking things are impossible. Forget the process, forget the funding, what are we trying to achieve and how do we do it? Keep the customer at the heart at it all. What did you put in place and what actions did you take? I changed the department structure and developed the attitude of always thinking “it’s never finished”. I developed the approach of looking to other places – the best research is in other places, UK and globally, always looking for both the good and bad. I established working with the private sector, embracing the ideas of private equity. The first 2 years was about getting the house in order, and the 3rd and 4th year are about working with the private sector. It’s about building mutual respect, and giving them confidence to invest in Birmingham. Developing a two way process so they get a perspective on our roles and we get a better perspective on theirs. I also run the Birmingham Housing Municipal Trust, so we build housing and know what it takes to build it. This helps you appreciate the challenges the private sector is facing. It’s not rocket science, but it is about knowing the market, and being able to be confident about getting a fair deal for the city and also knowing if developers can’t deliver, I can help them. As a housing development company, we were struggling with finding the right sites. It’s a big job to work out where the sites are, but for the market outside it’s even more difficult, without the local knowledge. So we developed a prospectus for sites, including constraints, sites, services etc and on the back of this, helped bring about 2000 homes forward. It was easy to bring together, helps developers with research and introduction fees, and they can easily spot the sites and who to contact. Other benefits have been created which we didn’t expect by working closely with developers. If they can see the purpose, such as industrial land being brought forward, they are willing to pay more attention to section 106 and provide employment or apprenticeships because of good working relationships. How can policy makers/practitioners benefit from developing their knowledge and use of evidence? The type of evidence we use can be very different depending on the activity – the local plan is very different to the big city plan. For a local plan you need scale of projections and development opportunities, technical evidence on transport etc. Although I always like work to be carried out internally to grow and retain knowledge, sometimes it is necessary to commission research externally, to be independent, check our understanding, and refresh it. Market evidence and financial modelling of impact, alongside economic modelling of the benefits are vital, but as planners we don’t articulate this very well – it starts and stops with place, but actually its long term, structural and widespread change that we need. I don’t bring consultants in to just take intelligence from staff – we use them for new things and to fill gaps in my own staff’s knowledge and ensure knowledge is transferred. I like to liberate staff, show them they can do it, that they have the talent and energy to make change happen – that’s important and personal knowledge enables that to happen. Planners need to make sure there is a strong evidence base to look at the overall locality, creating localised solutions, using projections and indicators, i.e. rents data or government locations. Evidence needs to balance with vision. It’s about being brave and ambitious about the art of the possible. How do you think people will be doing evidence, research and knowledge development in 5 years’ time? The biggest change will be building modelling into the evidence base, such as economic modelling to test impact, capacity, and income. Modelling the impact of new policies and what they actually do, such as the new homes bonus. We will continue to do traditional evidence work, but increasing the cross-policy integration and impact analysis of issues, such as climate change or flooding, using better data, which all has to be part of the impact measurement. What are the mistakes people make when it comes to developing evidence, things you which you really need to avoid? Understanding the quality of what’s out there – knowing how to ask the right question is how you get the right answer. It’s the first, and most important, stage. This means getting the brief right, otherwise you’re in the situation of ‘that’s what you have commissioned’ so can’t change it easily. When you are commissioning, build in flexibility, the ability to change the work to reflect the changing outputs of the research and the development of the findings and the new questions it raises. You need scope to look at projections which aren’t slavish to past trends, which can reflect the vision you are trying to create, not just tell you about the current state of play. These days all local authorities have lost the evidence base teams they used to have so building that skill set through the whole team is vital. If you had a list of ‘best-kept secrets’ about research, evidence and knowledge you would recommend, what would you include and why? Take graduates and train them, round their experience in all the areas, including the private sector – develop the future of the profession by creating good planners. Surround yourself with people who are better than you, their collective strength reflects well on you and it creates the best results for the place. Be Bold! Fortune favours the brave and the bold, we have a big responsibility and we have to be brave for the places we look after. Kim Ryley, recent Past President of the Society of Local Authority Chief Executives. This entry was posted in Government and politics, Planning, Planning, development and property, Regeneration and community development and tagged birmingham city council, Economic development, evidence based policy, graduates, housing, Knowledge Insider, knowledge management, local government, masterplanning, planning, regeneration, spatial planning, waheed nazir. Bookmark the permalink.